Step 1: Preheat oven to 375˚F (190˚C). 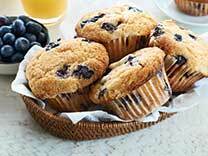 Line 12-cup muffin tin with paper liners; set aside. Step 2: Combine gluten free pancake and baking mix with salt in medium bowl; gently toss in blueberries. Step 3: Beat Becel Buttery Taste margarine with brown sugar in large bowl with electric mixer on medium-high speed until light and fluffy, about 5 minutes. Beat in eggs, buttermilk, vanilla and lemon peel. Gently stir in pancake and baking mixture with wooden spoon. Evenly spoon into prepared muffin pan. Step 4: Bake 25 minutes or until toothpick inserted in centre comes out clean. Let cool 10 minutes on wire rack; remove from pan and cool completely. Recipe Tip: If using a pancake and baking mix or a flour blend without baking powder and baking soda, add 1 Tbsp. (15 mL) baking powder and 1/4 tsp. (1 mL) baking soda to pancake and baking mixture. Nutrition information and more recipe ideas can be found at becel.ca. 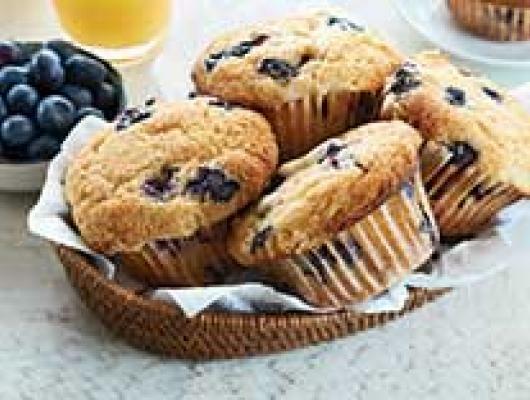 Try this delicious gluten free recipe idea.